The city is the administrative centre of the Central Coast region, which is the third largest urban area in New South Wales after Sydney and Newcastle. Gosford is considered a major commercial centre of the Sydney Metropolitan Area, and has been designated as an important growth centre under the NSW Metropolitan Strategy. The city's population was 155,271 in the 2006 census. Gosford is considered an exurb of the Sydney metropolitan area, with a significant proportion of the population commuting for work or study. This can be attributed to a lower cost of living, lack of employment and educational opportunities in the area, lifestyle factors and the development of strong transport links like the Sydney-Newcastle Freeway and Cityrail's Newcastle and Central Coast railway line. These factors have caused Gosford, and the wider Central Coast's population to grow rapidly in recent years. Until European settlement, the area around Gosford was occupied by the Guringai peoples, with the Guringai being principally coastal-dwellers. Along with the other land around the Hawkesbury River estuary, the Brisbane Water district was explored during the early stages of the settlement of Sydney. In the early 19th century some pioneering European settlers began occupying the land, for timber-cutting (mainly ironbark and Australian red cedar), lime production and grazing. Gosford itself was explored by Governor Phillip between 1788 and 1789. The area was of difficult access and settlement did not start before 1823. By the late 19th century the agriculture in the region was diversifying, with market gardens and citrus orchards occupying the rich soil left after the timber harvest. The first road between Hawkesbury, (near Pittwater) to Brisbane Water was only a cart wheel track even in 1850. Convicts once lived and worked in the Gosford area. In 1825, Gosford's population reached 100, of which 50% were convicts. East Gosford was the first centre of settlement. Gosford was named in 1839 after Archibald Acheson, 2nd Earl of Gosford – a friend of the then Governor George Gipps. In 1887, the rail link to Sydney was completed, requiring a bridge over the Hawkesbury River and a tunnel through the sandstone ridge west of Woy Woy. The introduction of this transport link, and then the Pacific Highway in 1930 accelerated the development of the region. Gosford has a humid subtropical climate, with warm summers and mild winters. In summer, temperatures generally range from about 27–28 °C in the day with high humidity and about 17–18 °C at night. Winters are mild with cool overnight temperatures and mild to occasionally warm daytime temperatures with lower humidity. Average rainfall is 1333.0 mm, a lot of which falls in the late summer and autumn. Records range from a maximum of 43.8 °C on 1 January 2006 to a low of −4.2 °C on 16 July 1970. The highest rainfall on record in gosford was about 1000 ml in 1 night. The north part of Gosford's CBD, looking down Mann Street towards the large yellow building which is the Imperial Shopping Centre. Gosford proper is located in a valley with President's Hill on the city's western border and Rumbalara Reserve on its eastern border, and Brisbane water to the city's south. Mann Street, Gosford's main street and part of the Pacific Highway, runs north-south contains the frontage for much of its commercial district. The Central Coast Highway runs past Gosford's waterfront area, while its predecessor the Pacific Highway takes on several names through the CBD itself. Mann Street contains the main public transport links for Gosford, with Gosford railway station (CityRail and CountryLink) and the termini for several bus routes. In the centre of Gosford is a shopping and community precinct, including Kibble Park, William Street Mall, Gosford City Library, the Imperial Shopping Centre, the Gosford Town Shopping Centre and a full range of shops, cafes, banks and services, especially along William Street Mall. More recently, the Gosford CBD has suffered a decline as more commercial activity has relocated to nearby Erina, particularly Erina Fair. To address this, there have been proposals to revitalise the city centre by more adequately connecting it to the waterfront, and provide more employment and entertainment areas. More recently the city has redeveloped its park in the city centre, including a stream, a restaurant and outdoor performance facilities. This will be the beginning of the redevelopment of the CBD. A small number of high rise developments have been built in the area as well, to encourage a concentration of residence in a bid to stimulate the economy of local business, and the local population, with more high rise developments planned. Gosford High School- The only academically selective high school on the Central Coast. The headquarters of the NSW State Government's workers compensation fund, WorkCover. St Edward's College, East Gosford- The only all boys private school on the Central Coast. Martin Lynes, Accomplished actor known for roles on All Saints and Packed to the Rafters. ^ "Gosford". Central Coast Australia. http://www.centralcoastaustralia.com.au/AreaInfo/towns_Gosford.asp. Retrieved 24 April 2012. ^ "Population Growth – Gosford City Council". Gosford.nsw.gov.au. http://www.gosford.nsw.gov.au/library/local_history/population/popgrowth.html. Retrieved 24 April 2012. 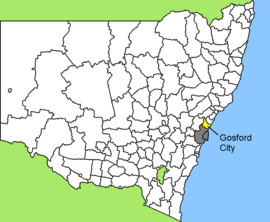 ^ "Gosford – Central Coast Australia". Centralcoastaustralia.com.au. http://www.centralcoastaustralia.com.au/AreaInfo/towns_Gosford.asp. Retrieved 24 April 2012. ^ ""Australians at the 1996 Atlanta Paralympics: Athletes". Australian Sports Commission. Archived from the original on 20 January 2000. http://pandora.nla.gov.au/nph-arch/2000/Z2000-Jan-20/http://www.ausport.gov.au/olym96/paraathl.html. Retrieved 4 February 2012. This page uses content from the English language Wikipedia. The original content was at Gosford. The list of authors can be seen in the page history. As with this Familypedia wiki, the content of Wikipedia is available under the Creative Commons License.